Hon’ble Prime Minister launched UJALA (Unnat Jyoti By Affordable LEDs for All) on 05/01/2016 for promoting use of LED lights and so that capital expenditure can be met. Under UJALA Scheme, Domestic Energy Lighting Programme (DELP) is for Household usages and Street Light National Programme (SLNP) is for Streetlights usages. Govt. of India appointed Energy Services Company (ESCO) and Energy Efficiency Services Limitd (EESL) as a Nodal Agency to implement this scheme. EESL is a joint venture of four Power Companies of Govt. of India (NTPC Ltd., Power Finance Corporation (PFC) Ltd., Rural Electrification Corporation Ltd. (REC) and Power Grid Corporation of India). EESL is working in co-ordination with Bureau of Energy Efficiency (BEE) and leading in the marketing activities of 8 important mission of Govt. of India including National Mission of Enhanced Energy Efficiency (NMEEE). 162 Municipalities and 8 Municipal Corporations in state have approximately 10.70 lakh street lights, out of these 1.10 lakh street lights had been already replaced by LED street lights and thus around 9.60 lakh street lights need to be replaced with LED Street light. The State Government vide GR dated 28/10/2016 nominated M/s EESL as the Nodal Agency to Implement LED Street Lighting Project for Municipal Corporations and ULBs of the State of Gujarat. State Government signed an MoU with M/s EESL in the presence of Hon’ble Minister, MoUD, GoI on 08/11/2016. 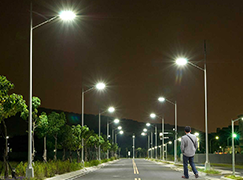 The implementation of LED Street Lighting Project is to start in all 8 Municipal Corporations and 162 Nagarpalikas soon once the agreements between EESL and respective Municipal Corporations/ Nagarpalikas are signed. Till now, 7 Municipal Corporations and 132 Nagarpalikas have signed agreements and works have started, there.